These black and white reviews were written by the well-known judge Daisy Roe for the 1973 and 1974 “Our Dogs” annuals. They were of great help and encouragement when promoting my newly established Westie Breeding Kennel. I still feel a sense of gratitude to her and I trust I have lived up to her kind remarks and expectations. 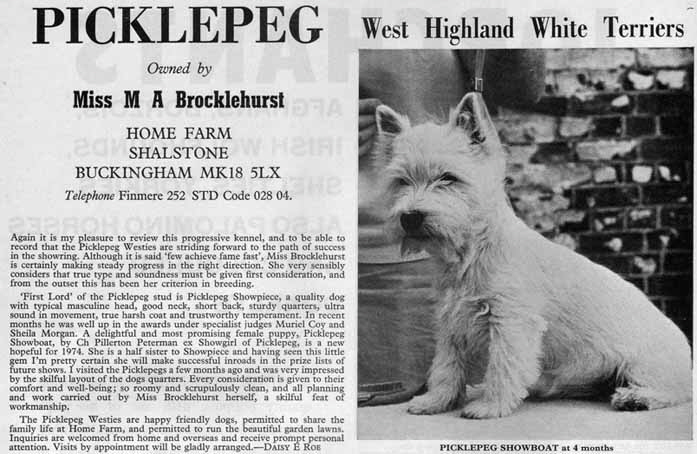 As a breeder of West Highland White Terriers for over 40 years and having shown Westie dogs at many Kennel Club meetings you can be assured of a high standard of Westie which not only has an excellent temperament, but is known for its fun-loving character and especially warm nature, ideal as a family pet.